Each Liberty Bell Half Dollar Pen Set includes a gold electroplated engravable base featuring a genuine US silver Half Dollar. The coin is precision gold-accented with Auristas Auretone process and protected with Lenscote. 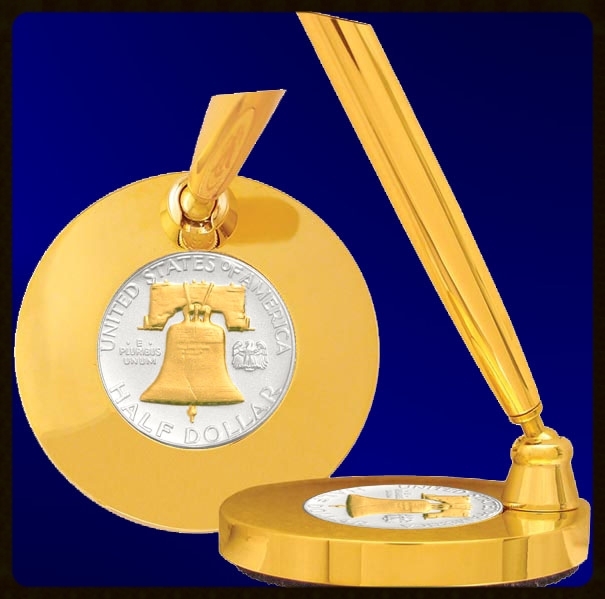 Each Liberty Bell (reverse of the Ben Franklin) Half Dollar Pen Set includes a gold electroplated engravable base featuring a genuine US silver Half Dollar. The coin is precision gold-accented with Aurista's Auretone process and protected with Lenscote to richly and permanently enhance the coins appearance. The end result is a timeless piece that adds a distinguished flair to the home or office. An executive order has forced the United States Treasury to discontinue selling many of their coin jewelry and collectibles themselves. This is the last chance to purchase these truly American treasures, as Aurista, being one of the artisans involved in their creation, has been allowed to acquire and liquidate these timeless pieces at never before advertised prices. All Treasury products will be backed by Aurista's own lifetime guarantee against defect.